London’s important Roman amphitheatre was excavated in the 1990s; its remains are displayed in the Guildhall Art Gallery. A timber amphitheatre, built c AD 74, included evidence of the eastern entrance, arena palisade, seating bank and associated drains. Shortly after AD 120 it was rebuilt with masonry foundations and walls, associated with new timber stands. By the mid 4th century the amphitheatre had been abandoned. The excavated evidence allows conjectural reconstruction and comparison with other British amphitheatres. Significant finds include an early 2nd-century AD dump of glass cullet, lead curses from the arena surface and samian pottery with gladiatorial motifs. MoLAS 2008. ISBN 978-1-901992-71-7. Hb 241pp + CD-ROM. 176 bl/wh and col ills. 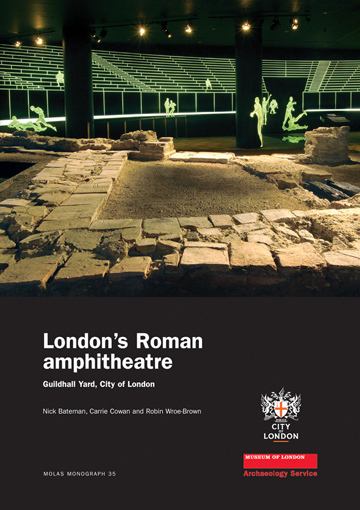 "Among the unending stream of major new discoveries from Roman London, that of the amphitheatre stands out. Its importance lies not just in confirmation that Londininum boasted such a structure but in the quality of preservation, particularly of wooden structures; the associated finds give insights into the monument and the way it was used which have relevance far beyond Britain itself. … The quality of the preserved woodwork, beautifully illustrated with photographs and line drawings, is stunning. … This superbly illustrated report, packed with so much new knowledge is a must for all Romanists." "The results of this work are now reported in an exemplary monograph…. The evidence from which the sequence is deduced is complicated, but the authors’ exposition is admirably lucid and thorough. Copious illustrations, both coloured and half-tone, clarify the text." "This is a beautifully designed book and competitively priced, given its hardback format and the scale of colour reproduction throughout. The use of colour in the book is extremely good: in particular, it provides excellent clarity for the many drawings. The photographs of the site and the material culture also benefit from the use of colour, giving the book a very attractive look and helping considerably to convey the detail of the site. There is no doubt that this discovery makes a major contribution to our understanding of Londinium and this volume presents the evidence clearly and in depth." "The publication of London’s archaeology has benefited greatly from the initiation of the MOLA monograph series, the house-style of which emphasises a synthetic approach and extraordinarily high production values, including the extensive use of colour illustrations… The archaeological sequence is extremely well presented, cogently written and is clarified by extraordinarily fine line-drawings and photographs… The volume must be seen as a major contribution, not only to the archaeology of London, but also internationally in amphitheatre studies. Its stands as one of the very few exemplary modern publications of an amphitheatre excavation." "… it is presented in such a clear and appealing format (including numerous reconstructive bird’s eye-views in colour) that it is likely to attract a broader readership. I found the sections that reconstruct the amphitheatre’s architecture as well as its sponsors and spectators – including evidence specific to the presence of women – to be particularly insightful."